Do people feel guilty about lying — and would they do it again? Finding a job isn’t always easy. You have to search for a job opening, draft the perfect cover letter and tailor your resume to the position. You might even have to throw in a white lie here or there to make yourself stand out. Who’s going to test you on your “fluent Hungarian,” anyway? Besides, everyone lies on their resume. Well, as it turns out, that’s far from true. GOBankingRates conducted a survey of 1,003 individuals to determine how many people lie on their resumes and, more importantly, why they do it. 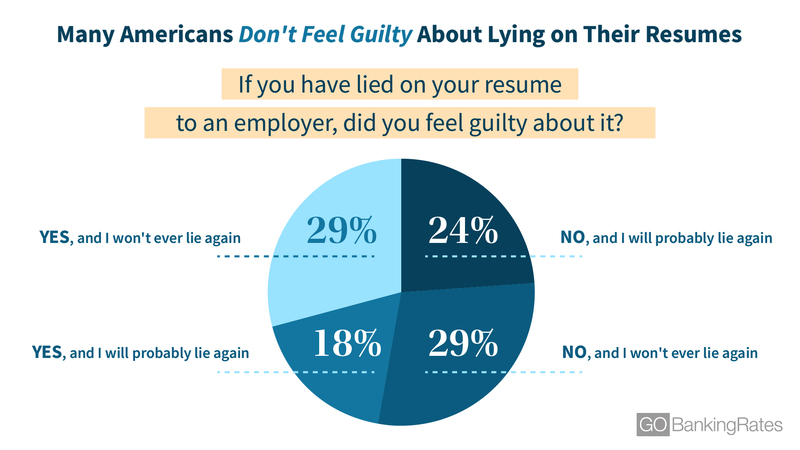 A surprisingly low number of respondents — a mere 5% — admitted to lying on their resumes. And that’s not the only surprising result — keep reading to learn more about the survey’s findings. When asked if they had ever lied on a resume, 85% of respondents stated that they had not. An additional 9% said that they had never lied but admitted to being tempted. And, among the 5% of people who admitted to falsifying information, over half were repeat offenders. Though only a small number of respondents admitted to lying on their resumes, the real number could be much higher because the idea of lying is nuanced. While one person may believe calling themselves proficient when they are just intermediate constitutes a lie, another may consider this strategic embellishment. Older baby boomers ages 65 and older were the most honest on their resumes, with only 2% stating they had lied at least once. Millennials ages 25 to 34 were least honest, with 11% admitting to lying. Interestingly, the age group most tempted to lie was the youngest — Generation Z — with 14% claiming they had considered it. When it comes to resumes, women are slightly more comfortable with lying than men. Six percent of females stated that they had lied at least once, while only 5% of men admitted to doing so. Furthermore, 10% of women were tempted to lie on their resumes, while only 8% of men felt the same inclination. Survey Question: Have you ever lied on your resume (either when applying for your current job or past jobs)? Note: Values may not add up to 5% due to rounding. Exact values of the “yes” answer choices are 1.89%, 2.89% and 0.7%, respectively. Though most people claimed to have never lied on their resumes, they believe that others do it. Forty percent said that they think some people — less than half of the population — lie on their resumes, while 28% believe that half of the population is doing it. Professionals seem mixed about the amount of lying that’s going on, too. But, again, it comes down to how you define a lie. Jenny Foss, a job search strategist, certified professional resume writer and the voice behind career blog JobJenny.com, said, “It’s rare that I encounter someone who completely fabricates something on their resume.” Foss noted that “truth-stretching” — for example, saying you had more responsibilities than you actually did — is far more common. That said, she agreed with Foss when it came to the lying breakdown. “Outright lying … is only 15% to 25%, but exaggerating skills or making job titles sound more appealing … happens 50% to 60% of the time,” White said. Survey Question: How many people do you think have lied on their resumes at least once? 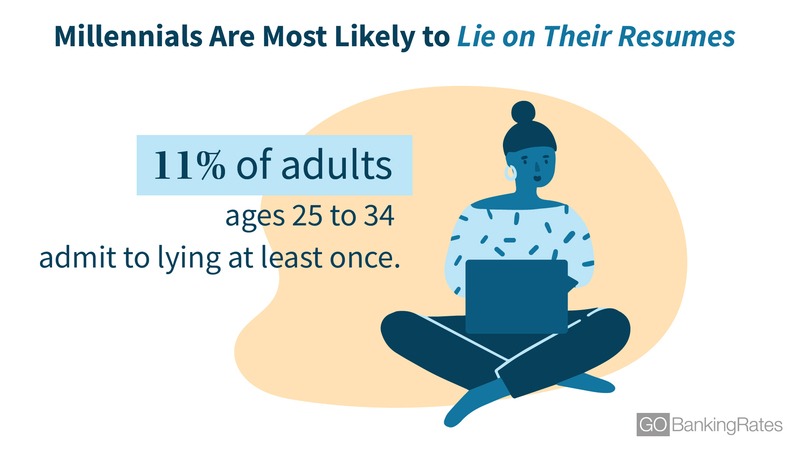 Millennials — the age group that admits to lying on their resumes the most — might be justifying their actions with the incorrect belief that lying is the norm. Twenty-three percent believe that more than half of the population lies on their resumes, compared to the actual figure of 5%. Across all age groups, 23% of men believe that most — if not all — of the population lies on their resumes, and 20% of women believe the same thing. Of the Americans who admitted to lying on a resume, 38% said the lie concerned their work experience. The next most popular answer was dates of employment, at 31%. Only 2% of those who lied did so about internship experience, while 4% said they were lying about a GPA on their resume. Survey Question: If you have lied on your resume, what factors did you lie about? Select all that apply. Note: Responses are from Americans who have admitted to lying on their resumes. The majority of all age groups who admitted to falsifying information said they lied about work experience and dates of employment. However, for younger Gen X individuals ages 35 to 44 who have lied on their resumes, 38 percent said they weren’t truthful about their college education. Of the Americans who lied, more women admitted to lying about their dates of employment than men — 41% and 19%, respectively. More men admitted to lying about work experience than women, with 46% and 31%, respectively, altering their job history. 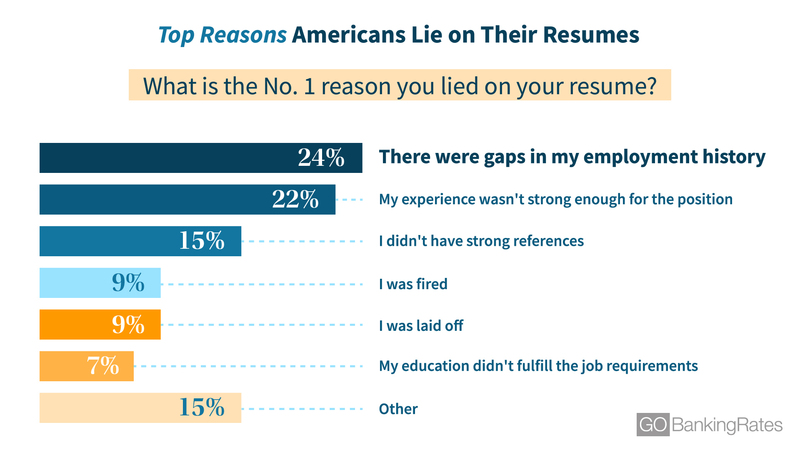 Those respondents who admitted to lying on their resumes did so primarily to hide gaps in their employment, with 24% providing this reasoning. Coming in at 22%, a close second, was lack of necessary job experience. The reason behind the reason — or, the reason why people lie about a lack of necessary job experience — could be shame about previous jobs or a feeling of entitlement. Rich Franklin of KBC staffing, who possesses over 20 years of recruiting experience, said he has encountered numerous job candidates lying on resumes, but one sticks out in particular: an employee who had falsified work experience. Sixty-three percent of Gen Z individuals ages 18 to 24 who lied on their resumes said they did so because of a lack of job experience, which might come as no surprise given the age of Generation Z — many may be fresh out of school. What’s surprising, though, is that the majority of younger baby boomers ages 55 to 64 who admitted to lying did so for the same reason. 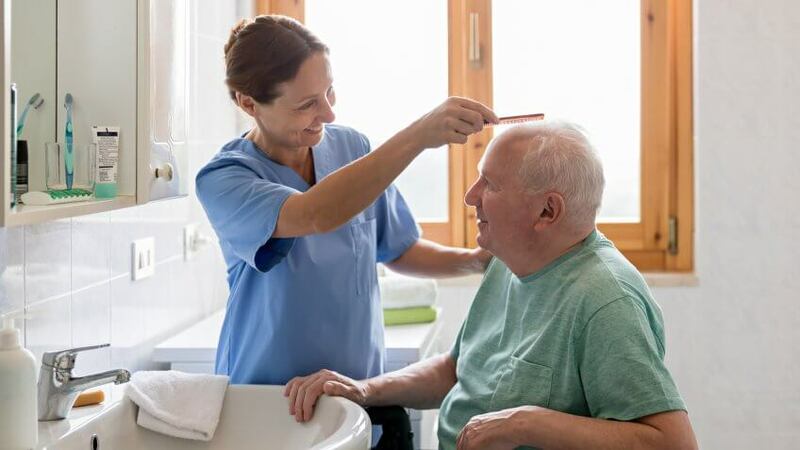 This could be due to a rise in technology, which might make older individuals feel they are unqualified to work with certain programs. For millennials who admitted to lying, 46% did so because of gaps in employment. Thirty-eight percent of younger Gen Xers lied for the same reason. These numbers could be attributed to the recession and high unemployment rate that occurred during a large chunk of millennials’ and Gen Xers’ time in the workforce. For men who admitted to lying, 19% said the reason was lack of experience. The same number said they lied due to a layoff. Oddly enough, 0% of women answered that they had lied due to a layoff. That said, more women than men cited lack of experience (24% vs. 19%, respectively) and gaps in employment (31% vs. 15%, respectively) as their No. 1 reasons for lying on their resumes. It seems that most Americans who have lied on their resumes aren’t remorseful. Forty-seven percent stated that they didn’t feel guilty about lying, and nearly half of those respondents said they’d do it again. Of those who said they did feel guilty, 18% indicated they might lie again. When it comes to millennials who lied on their resumes, the majority — at 73% — didn’t feel guilty. And, whether they felt guilty about it or not, 55% of millennials who lied said they’d likely do it again. Younger Gen Xers had the most extreme response, with 63% stating they did feel guilty about falsifying information, but that they would probably lie again anyway. After lying on their resumes at least once, 52% of women and 65% of men said they wouldn’t consider doing it again. But, intriguingly, men felt worse about lying in general, with 54% admitting they felt guilty versus only 42% of women. Think about it. If you get a job cooking at Saison, a restaurant with the prestigious Michelin three-star rating, by claiming you have experience working at other fancy places — when you’ve actually only worked at Chipotle — you’re going to be a hot mess in that kitchen. Sure, you might be able to wield a mean guacamole scooper, but you’re going to struggle to produce the results that a Michelin three-star establishment requires. And, if someone finds out, the restaurant’s reputation could suffer, and it could lose valuable patrons and contracts, damaging its bottom line. When you get down to it, it’s all about turning negatives into positives and portraying yourself in the best light possible — without lying. Click through to see how lying can also ruin your relationship. Methodology: This survey was commissioned by ConsumerTrack Inc. and conducted by Survata, an independent research firm based in San Francisco. Survata interviewed 1,003 online respondents between March 28, 2019, and April 1, 2019. Respondents were reached across the Survata publisher network, where they took a survey to unlock premium content, like articles and e-books. Respondents were asked a screener question regarding employment status before answering a series of questions: 1) Have you ever lied on your resume (either when applying for your current job or past jobs)? 2) If you have lied on your resume, what factors did you lie about? 3) What is the No. 1 reason you lied on your resume? 4) If you have lied on your resume to an employer, did you feel guilty about it? 5) Which of the following industries are you currently employed in? 6) How many people do you think have lied on their resumes at least once? Questions 2-4 were only answered by respondents that chose one of the three “yes” answer choices for Question 1. Those who selected a “no” answer choice skipped over those questions. Find out how much nurses make in your state.